The König Ludwig Lauf was born in 1967 in an Oberammergau Wirtshaus, the idea of Fritz Lang and Benedikt Stueckl. Their aim was to create a popular cross-country ski race that would be longer than the world-famous Vasaloppet. Vasaloppet at that time was 89 km in length and so the original König Ludwig Lauf course was set at 90 km. 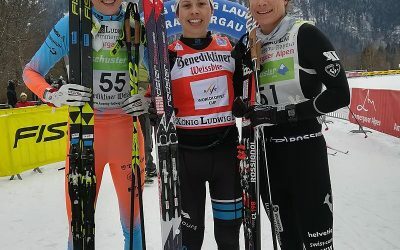 At first the race was called ‘Bayerischer Skilanglauf auf König Ludwigs Spuren’ (Bavarian cross-country ski race in the tracks of King Ludwig), but within a few years the name had been changed to ‘Ludwigslauf’. The name was derived from the fact that the race ran through land that at one time belonged to the king. In 1980 women were allowed to take part in the 90 km race for the first time and the number of participants set a new record of over 3000. By the mid 1980s recurring problems with snow forced the organisers to shorten the course to 50 km. The weekend now also included a shorter 23 km race and a 5 km ‘Mini Kini’ for children. 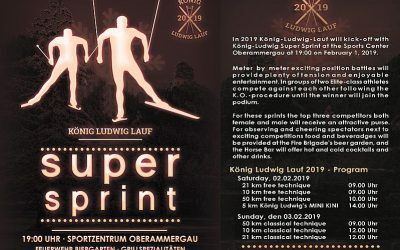 The König Ludwig Lauf takes place in one of the most scenic parts of Germany, the wildlife sanctuary ‘Ammergebirge’ and the organisers, together with 400 volunteers; have to work in very close cooperation with the forestry department to ensure that the environment stays totally unharmed. The start for all races is in Ettal and the main race follows the route from Ettal to Graswang, Linderhof and back to the sports centre in Oberammergau. The area has been described as a paradise for cross-country skiing. By plane: Closest international airport in in Munich. By car: It is 1,5 h drive to Munich airport to Oberammergau.